Mainstream media would like prospective college students that tuition is on a runaway path and private college affordability is out of reach. Taking a step back and analyzing the facts will provide a holistic picture on private college tuition trends. Our goal is to provide a fact-based, no-nonsense analysis of private college tuition trends. Empirical data will allow you to draw conclusions to help you make a great decision about your future. Mining government databases and reputable information will help provide an unbiased and realistic view into the cost of going to college. Let’s jump into a few key pieces of data to help current and prospective students understand the landscape of higher education. It is true that tuition rates are increasing at colleges and universities across the country. A recent survey produced by the College Board reflects this truth but in surprising ways. Take a look at the three different college groups: private colleges, public 2-year colleges, and public 4-year colleges. 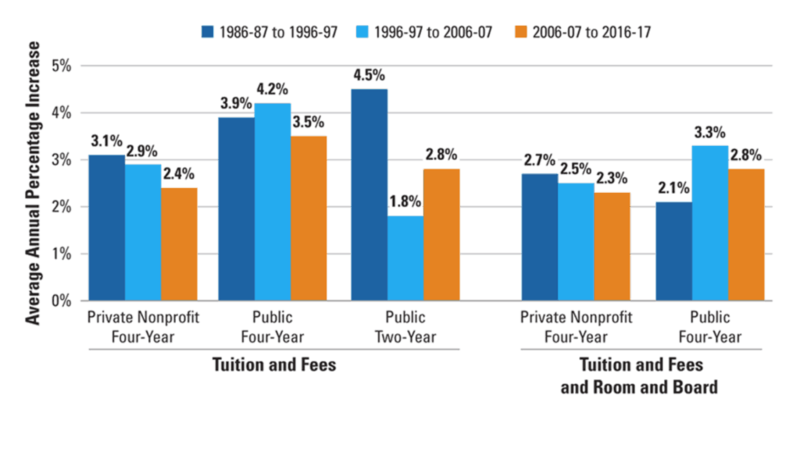 The rate of tuition increase for public 2-year colleges and public 4-year colleges from 1986 to 1996 was 3.9% and 4.5% on average, respectively. During that time, the tuition increases at private colleges was 3.1%. Likewise, the following reporting period shows public 4-year colleges increasing tuition 4.2% while private colleges dropped to 2.9%. In the most recent reporting period, 2006 through 2016, both public 2-year and public 4-year programs outpaced the tuition increases at private colleges. Annual tuition increase at private colleges and public colleges from 1986 to 2017. 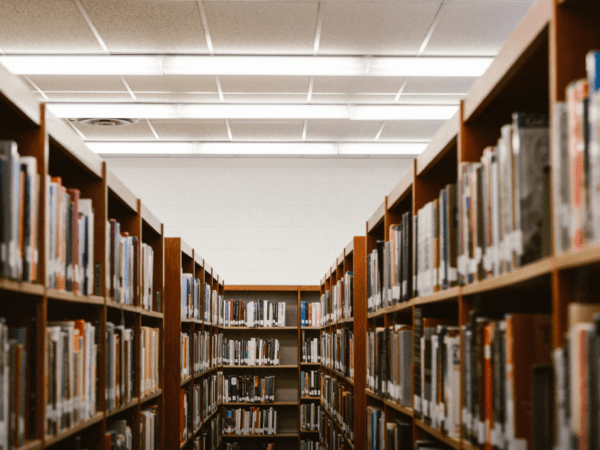 A recent study published by the NACUBO reveals the rate of discounts at private colleges that helps bring the net cost of college at private colleges into better focus. Approximately 88% of all college freshman and 79% of college undergraduates received grant aid for the 2016-2017 school year. In fact, the grant aid received by undergraduate students ended up covering more than half of college tuition and fees, on average. As you can readily see from the data below, tuition discounts at private schools has steadily increased over time reaching a peak this past school year. Suffice it to day, the tuition discounts are substantial. With an average tuition discount of 49.1% for first time, full time students are the benefactors of private university financial aid. 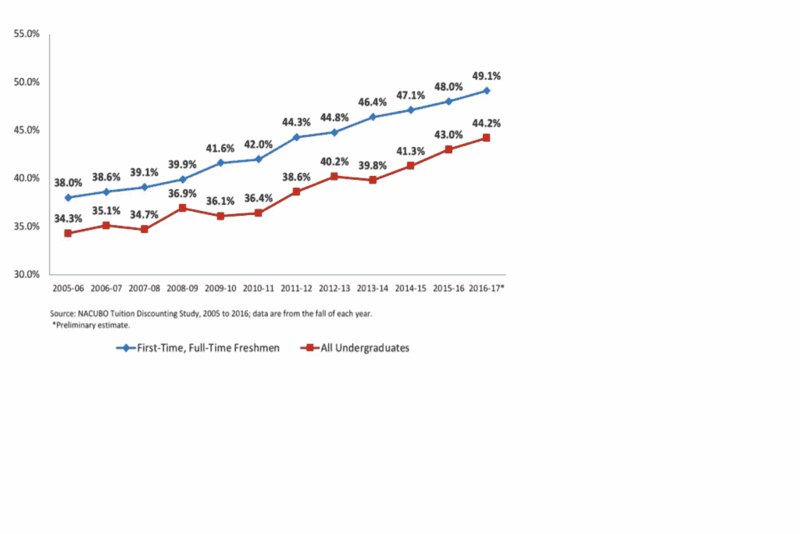 Trend of tuition discounts at private schools in the United States at all time high of 49%. The United States Census Bureau released information this month that helps shed light on the opportunity cost of not attending college. The data reveals that the average earnings in 2016 for citizens of the United States with a high school diploma is $35,615. Compare that to the average income for a citizen with a bachelor’s degree at $65,482 a year and $92,525 a year on average for advanced degree holders. Quick math shows the value of earning a bachelor’s degree is nearly $600,000 compared to a worker with a high school diploma. Taking all pieces of data together, you can easily see the raises in college tuition compared to tuition discount increases along with a widening wage gap between people with and without a college degree. To learn more about the best college program for you, simply visit our proprietary matching portal or online school resource center. Alternatively, you can quickly find a list of private colleges by state by visiting state portals like California, New York, Florida, and Texas today via the list below. Students looking to gather additional information can do so with thousands of resources across our digital portal. Analyzing private colleges by state is only the start. You can delve into the schools financial aid trends and enrollment by visiting the school's profile page. Alternatively, you can search for degree programs by starting with our top majors page. The top 200 college degree programs are listed to help stimulate ideas about areas of interest. Dozens of career guides have been created to provide insights into degree programs and career paths in specifics fields or trades. Get plugged in and get started on your academic journey.